The best of both worlds! Our Range Fire composites are simply Charolais x Red Angus cross cattle. We have found this cross to have appeal as replacement females, commercial bulls and as feeder cattle. 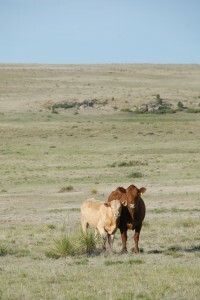 The Silver Spur Range Fire program is dedicated to establishing multiple generation cattle with known performance data. We will market Range Fire bulls in our annual Production Sale and utilize females to build our “seedstock” and commercial herds.